Swedish people enjoy living life, spending quality time with family and friends, being active and being outdoors (regardless of the weather) and eating local and seasonal produce. The West Coast of Sweden encapsulates the Swedish way of life and this four night itinerary highlights some of the best destinations to experience this way of life first-hand. On arrival at Gothenburg Landvetter airport, collect your hire car and drive to the picturesque village of Fjällbacka and your accommodation – Stora Hotellet Bryggan. Overnight at the Stora Hotel Bryggan, Gothenburg and The West Coast. Opportunity to visit the Weather Islands, home to some of the most unspoiled landscapes in Sweden and the westernmost point of the country. Accessed by boat from Fjällbacka, these picturesque islands (365 in total) have only one island where development is evident, the island of Ramna, and are rugged, barren, and truly beautiful. Although small in size, Ramna warrants a day excursion. Visitors can climb to the top of the pilot’s look out point for a great view across the island and the surrounding archipelago; scramble across the rocky landscape and admire the reflections of the red wooden houses in the crystal clear water or watch the dramatic ever-changing weather conditions from the comfort of the warm café at Väderöarnas Vardshus. Take a drive along the coastline and discover quaint waterfront communities such as those at Grebbestad, Lysekil and Fiskebäckskil, and the nature reserve on Resö island. 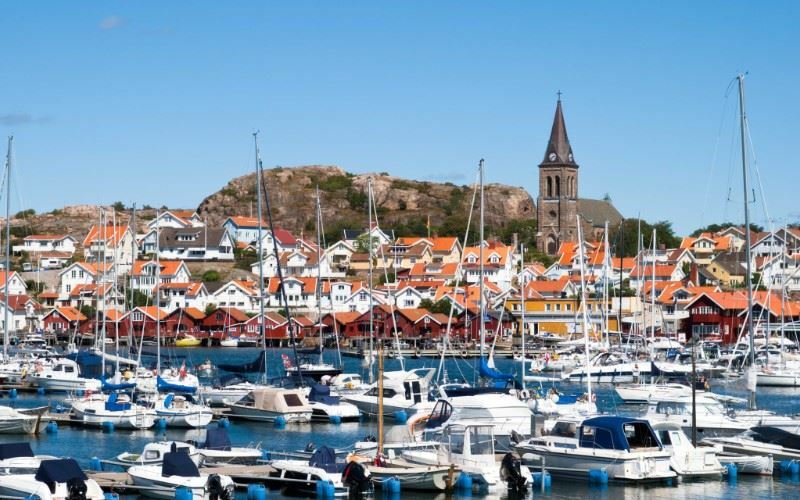 A favourite destination of the Sunvil team is the village of Smögen, with its colourful fi shing huts, busy pier, wooden jetty and exclusive boutiques - Smögen is the epitome of a Swedish summer resort. In the afternoon, return to Fjällbacka. Overlooking Fjällbacka is Vetterberge, a granite cliff from the summit of which there is a wonderful panorama out-to-sea and over the pastel-coloured wooden houses of the village. The sunsets from here are majestic. Free time to relax in Fjällbacka. Sit back on the deck and read, wander the cobblestone streets or visit one of the cosy cafes - the choice is yours. Alternatively, take the opportunity to visit the rock carvings in Tanum (a UNESCO World Heritage Site); participate in a seafood experience or hire a sea kayak and explore the Fjällbacka archipelago independently. The idyllic coastal village of Fjällbacka, with its picture-postcard harbour front of colourful wooden buildings, rocky backdrop and lively summer scene was the favourite retreat of film star Ingrid Bergman. The idyllic coastal village of Fjällbacka, with its picture-postcard harbour front of colourful wooden buildings, rocky backdrop and lively summer scene, was the favourite retreat of film star Ingrid Bergman. It is also famed as the birthplace of the Swedish author Camilla Läckberg and the setting for her crime novels. The charming Stora Hotel Bryggan is located in the centre of Fjällbacka. A warm welcome from owners Susanne Maxvall and Peter Holmstedt and their team, and homely accommodation await guests. The guest accommodation is decorated in either a Newport maritime style or in a style that symbolises a city or destination.